Today is National Bundt Day. Stacie pinned The Food Librarian’s celebration of the bundt cake recently and since I love a bundt cake (delicious cake, little to no frosting, perfect for unfancy days without a lot of fuss), I decided I need to join in. 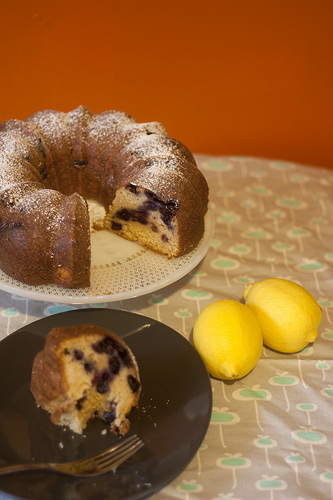 I baked the blueberry lemon bundt from martha stewart and it’s delicious, although the lemon flavor is perhaps a little more subtle than I’d like. I suppose I could solve that with a lemon glaze or by adding more zest or some lemon extract though. Hooray Bundt Day! I got sidetracked and didn’t get a chance to make one yesterday, but I’m hoping to get one done today! Gorgeous cake – looks really delicious! 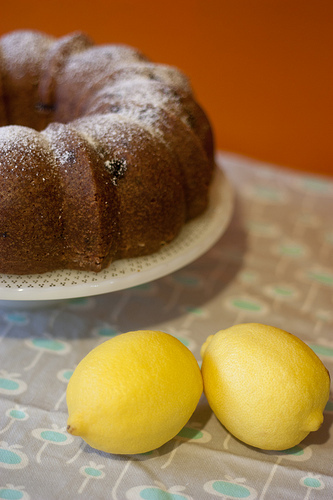 For intense lemon flavor, I like melting sugar in lemon juice over medium heat until it’s all liquidy, and then poking holes in the cake while it’s still hot and pouring the glaze over…super tart and the lemon flavor goes through the whole cake!